Each breath of air we take up fills our body with vital energy and is a confirmation of the perfect unity in Nature. The same herbs that give us the oxygen that we need so much to live, care to relieve our suffering in acute or chronic airway inflammation. The fragrant lime flowers exert a prolonged action, increasing heat emission, lowering the fever. The snuff in the colors of the black elder and the sweet root "cover" as a paw the inflamed mucous membranes and soothe the cough reflex. 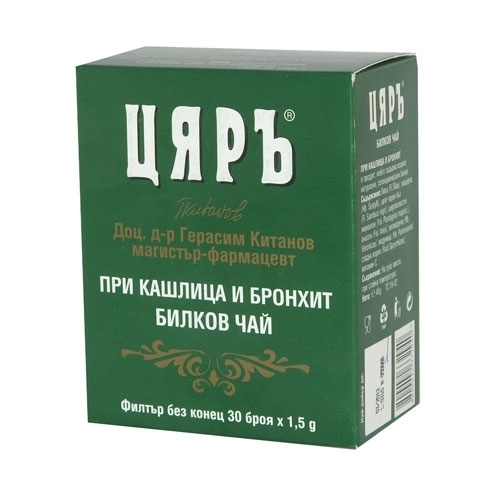 The gentle Easter and the fragrant "Babina Souhita" have a softening, anti-inflammatory, expectorant and antiseptic effect, which favors vital tone. Vitamin C restores strength and strengthens the body's protective ability. One cup of tea contains at least 25% of the daily requirement for vitamin C for an elderly person. Lipase, thyme, black elderberry, broadleaf, anise, Easter, medulla, sweet root, vitamin C.
Pour one filter bag with 200 ml of boiling water. Spill 4-5 minutes. Add one teaspoon of honey. - Never drink the herbal tea very hot. This is only acceptable if you want to cause sweating. - Drink tea in slow and if possible small sips. Enjoy it and constantly think about its particular impact. - Drink at least one cup of tea in the morning in a starving heart. This increases the activity of the active substances in the body.